Aside from when it rains, and they refuse to leave the coop, our chickens are outside during the daylight hours. If it takes 30 minutes to lay an egg, that is nearly 11 ½ hours to wander around the garden digging holes. I had no idea the extent of a chicken’s digging habits until I watched them happily shovel craters all over our garden as the snow melted. Our mulched garden began to resemble a mogul field, to my dismay and ankle-twisting trepidation. Last weekend we sequestered the girls to the back half of the garden. 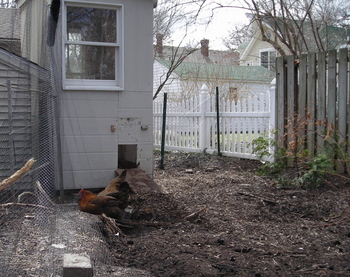 Our chickens appear to scratch and dig for two reasons: to peck for food and to bathe in the soil. Chickens don’t have teeth. In order to digest food, there is an organ along the digestive track called a gizzard. The gizzard becomes filled with small bits of gravel. The muscular organ contracts and constricts, grinding the grains between the gravel, chewing them. In factory farms, the chickens are fed small stones. We stopped feeding gravel to the girls when they became big enough to dig in the earth and find stones and grit au naturel. In addition to digging for gravel, our chickens dig to eat worms and bugs (and anything green coming up). I like worms. I like what they do to the earth. I like that earthworms are a sign of happy soil. Yet, I look on with pride when my girls scratch in the warming earth and fight over a big juicy earthworm. Aside from the nutrition, I feel that it is a signpost of all things natural in the world. The early birds have been getting the worms for a long time, and I hope and trust that they will continue to do so. After a chicken has dug a very good hole, she will often lie in the earth and give herself a bath. Dust baths are very important because the soil is prevention against mites and lice. In factory farming they use dusting powder to achieve the same results against chicken parasites. The girls are getting exercise, feeling the sun warm their wattles and doing what they are instinctively drawn to do to keep themselves healthy. I find the dust baths hilarious, except I don’t want them happening where our new fragile plants are coming up. So the girls have been cordoned off for the duration of the warmth. I imagine sometime around October we will give them free reign again. This entry was posted in On the Farm and tagged Backyard chickens, Corinna Borden, eggs, locavore, Real Time Farms. Bookmark the permalink. I have a few questions about backyard chickens. How do you keep them safe from predators? I can’t be out there day in and day out and it seems like everyone that has chickens ends up with a fox/mink/hawk etc in their chicken coop. Next question: How often do you clean the chicken coop? Does it require cleaning or do the birds prefer to keep their mess outside the house? What do you do with the birds if you leave for a weekend? Are they allowed to come and go as they please? I would assume that would keep them vulnerable to predators? Please email me back as this is something I’ve been toying with for a while. Thank you for these good questions. We are very lucky and live in Ann Arbor, so we have very few predators. The key that I have found with farmers I know who are outside the city limits is really making sure that #1 you close them up come nightfall and #2 that your coop is really solid. But that being said, I have still heard horror stories about girls being eaten through chicken wire. We utilize the deep litter method – which is when you pile sawdust on the bottom of the coop – this means we turn the sawdust every few days or so, throw an extra handful on – and once a year throw the sawdust onto the compost pile. According to Rodale the sawdust breeds goodies that keep the mites down for the girls. For the weekend, we built an area that is totally enclosed that they can access by going out the window – so we do that. We also have curious neighbors who are willing to let them out and close them in at night in exchange for the eggs!